If you are a property owner that is considering monetizing your wireless lease rents or an institutional investor trying to determine the value of lease/easement cash flows under wireless infrastructure, information on street-level, market pricing is not readily available to you. Our Market Data section provides current, real-time insight into the market that could be of use to you as you weigh your options or undertake due diligence. The various firms that offer to purchase wireless leases from property owners are motivated to do so as cheaply as possible. 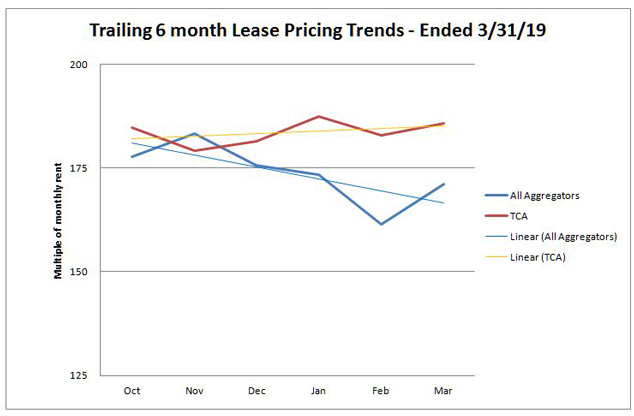 Having information on current lease offer trends is imperative and TCA is the only firm to publish them. Knowing how much an asset is really worth in today’s market is a must for a Seller. If you would like to maximize your price as a Seller or be sure you aren’t over-paying as a portfolio Buyer, reference the quarterly updated data provided in the tables below at TowerCapAdvisors.com or contact us at info@towercapadvisors.com for more information today. Note: Averages are calculated by TCA from discussions with both site owners and industry personnel and are normalized for perpetual purchase terms and 3% per year (or 15% per Term) escalations. Lower escalators would result in lower offer prices. Higher annual escalators could result in higher than average offer prices. Data also nets out short-term expiration purchase offers (offers for leases with 5 or fewer remaining years in the lease terms provide a pro-forma rent hike opportunity for the buyer). 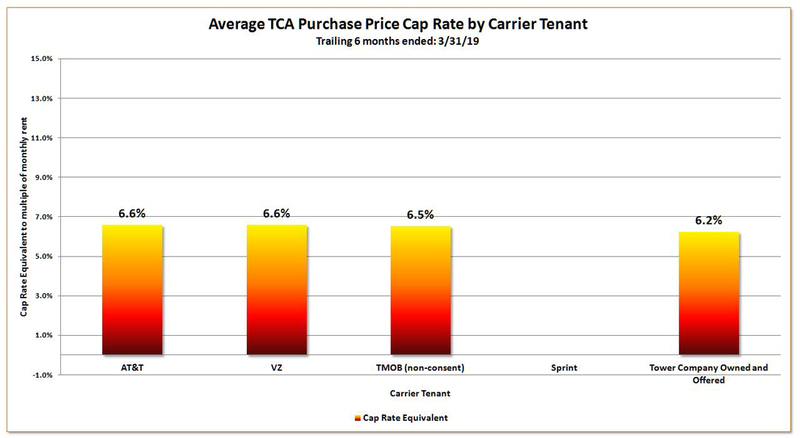 – REGARDING SPRINT LEASE VALUATIONS: The average price recorded during Q4, 2018 and Q1, 2019 for Sprint leases shown in the chart above reflects TCA (and all others) no longer making any offers for Sprint leases. Despite recent news (April, 2019) suggesting the DOJ may feel otherwise, the market believes there are few headwinds left to the announced T-Mobile/Sprint merger and Sprint landlords will eventually see the same site de-commissioning seen with Nextel, Cricket, Clearwire and MetroPCS locations. 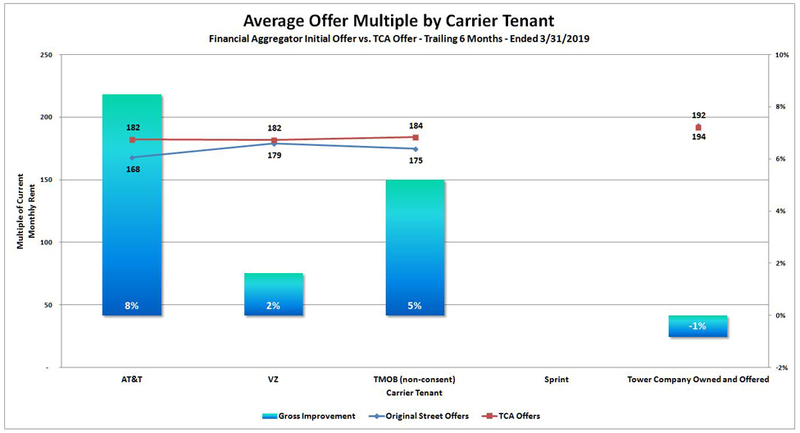 TCA is recommending that Sprint landlords wait for the outcome of the merger rather than selling their Sprint leases outright for very low multiples. It could be that T-Mobile chooses a Sprint location for their equipment, so hold onto your lease. 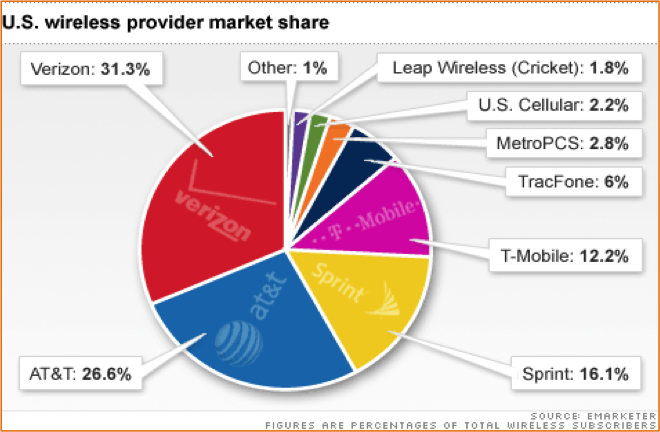 With the exception of prices for Sprint and their affiliate leases, Q1, 2019 prices for wireless leases as offered by both financial * and strategic ** buyers in the U.S. domestic markets demonstrated the usual seasonal chilling that takes place after a 4th quarter buying frenzy and are now rebounding solidly in March. In fact, we have seen some of the highest offer prices in our history of having tracked them for rooftop assets in particular from both buyer during the last 30-45 days. Prices for ground leases under towers as well as rooftop leases with the remaining three major US carriers as tenant-credits continue to demonstrate cap rates well below those associated with other commercial real estate. Thus monetization of wireless leases continues to be accretive to a property owners return on equity. 2019 may see continued pressure by the Fed to raise rates and resultant increases in the cost of borrowing by buyers of these assets could see price declines. While all three of the public tower companies still have a heavy focus on extensions, acquisitions and buy-backs of their own ground leases as a way to protect them from rent increases, two of the three are making somewhat competitively priced (if not simply structured) offers for rooftop leases as well. These offers are structured for potential upside granting marketing rights and/or expanded easements across the property and tend to be more complex than those offered by financial aggregation firms. They require significant control over the property for telecom installation purposes while offering sharing arrangements in any new tenant revenue that comes on the property (whether through the buyer’s effort or fortuitously) to the seller/property owner. With fewer viable tenants on the horizon and the continued use of smaller, regional tower companies for build-to-suit infrastructure by the carriers in lieu of using the larger public tower co’s as they have in the past, the realization of that upside should be weighed by sellers of rooftop leases against what is the strategic buyers more controlling and slower closing process. We also continue to believe that strategic acquisitions of rooftop leases that offer seller’s sharing in new tenant revenue can be conflicted with the buyers interest in locating new tenants on their own towers rather than on a rooftop that requires a split with the property owner. Tower Company offers for their own ground leases: The public tower companies have demonstrated that they are quite interested in protecting their tower assets and in defending against 3rd party acquisitions of ground leases under their towers. As you can see from the above chart, TCA has managed to stay at (or close to) par with their offers (-1% as of Q1) by offering structures that do not expand the easement area and, if present in the lease, leaving revenue sharing provisions with the seller as possible future revenue opportunities. We also offer a much simpler closing process, documentation and shorter closing time (absent a need to get the consent of a mortgage holder, closing time should be less than 45 days vs. times 3 to 5 times longer to close with some of the public tower companies). Shorter closing time means lower legal costs for the seller. 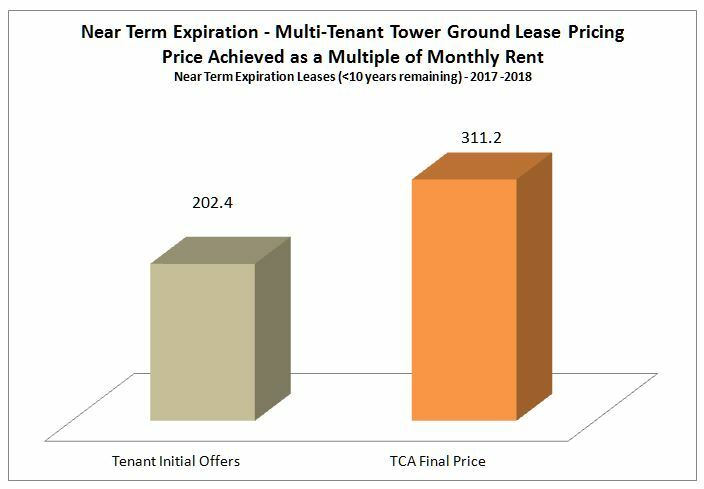 Near-term expiring tower ground lease pricing: While offer prices by all firms for ground leases under cell towers seemed to continue to stay in the same range they have been in for the last two years, offers for ground leases under towers with multiple tenants whose final expiration is within a 1-10 year time frame have reached extraordinary levels. TCA continues to recommend that property owners with leases whose final expiration is coming due in the next few years not sign extension amendments or lump sum offers without consulting with an expert. We provide pro bono estimates of value for tower ground leases meeting this criteria to all property owners. Who is a Buyer and who is a Broker? : An influx of formerly employed originators from the financial acquisition firms has also increased the number of ‘brokers’ or intermediaries operating in the market offering to either advise sellers for a fee or seeking to broker their identified transactions to one of the portfolio buyers for a fee. We have seen a number of these brokers attempting to arbitrage huge profits at the expense of the seller, so caution when dealing with them is advised. Note TCA does not charge private property owners for our advice, regardless of whether we do a transaction with the seller or not. In 2018, we continue to see a number of the formerly capitalized financial aggregation platforms that have lost their own funding become ‘straw’ buyers for the tower companies. This type of relationship may require the ‘straw’ buyer to sell the assets directly to your tenant after closing or assign the rights they have obtained to your tenant, thereby making any promised revenue-sharing arrangements hollow at best. If there is a Right of First Refusal clause in your lease and someone other than your tenant is making an offer to buy it, a seller needs to understand that this buyer is almost certain to have a relationship with your tenant and will be ‘giving’ something to them to get them to waive their rights under this clause. TCA cautions prospective sellers that offers by buyers to ‘share’ in rent increases above ‘scheduled rent’ at lease expiration or renewal should be viewed with suspicion or ignored when evaluating purchase price and structure, especially if there is a Right of First Refusal in your lease. Those transactions are highly likely to be favorably amended for the tenant by the buyer post closing. Extension amendments and ROFR clauses: The sale of most of the towers previously owned by AT&T, T-Mobile and Verizon to the large public strategic tower companies created a furious ‘amendment and extension’ initiative by the tower companies as they attempted to lock-up the rent on leases that would expire in the near future and remove the possibility of the property owner negotiating a higher rent at lease expiration. Just as importantly, your new tower company tenant is very interested in obtaining Right of First Refusal (ROFR) clauses in leases that did not previously have them. This is done to prevent other firms from purchasing the leases and, in turn, looking to increase their rents. We strongly suggest that sellers contact TCA if you are being pressed to sign extensions or amendments with ANY tenant. Having a ROFR in a lease with a tower company tenant reduces the value of your lease because it also reduced the number of firms willing to make an offer to purchase it – leaving mostly the ‘straw’ buyers to make offers. ROFR’s in carrier leases are much less of a concern as carriers often do not have the capital to exercise their ROFR rights. * Financial aggregation firms are companies that acquire the assets with the intent of either just collecting the cash from the lease as is and holding it or, more often, firms that buy with the intention of ‘flipping’ to tower companies or into securitizations. Despite often requiring that they buy an expanded easement area with a ‘sharing’ arrangement back to the seller for any new tenants that come to the site, financial aggregation firms have little to no history of being able to ‘lease up’ a property. Note that Sellers should be very cautious of letting any financial buyer expand their easement as part of the purchase process. See the Recommendations for Sellers in the Lease Buyout section of TCA’s website. ** Strategic aggregation firms are companies that own and operate thousands of assets across the US and are capable of bringing additional tenants to a property that has their own tower on it. 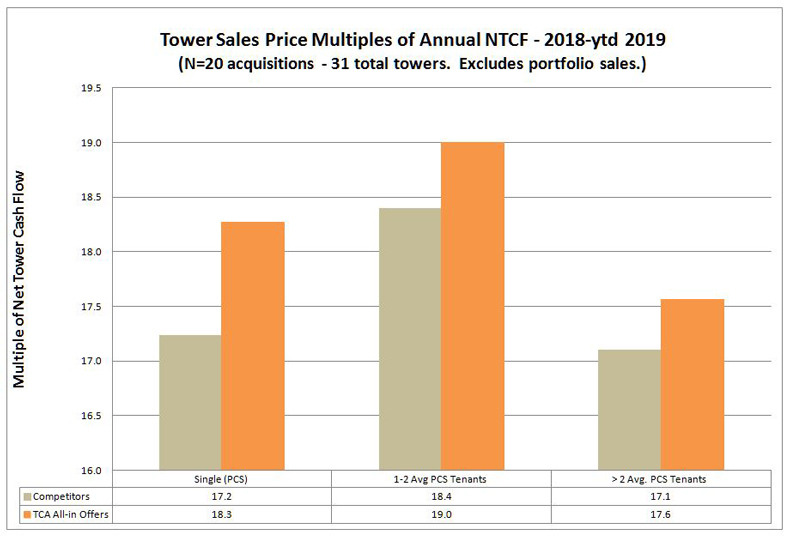 Tower Capital’s Near Term Lease Expiration Purchases – In the most recent quarter, Tower Capital has undertaken an initiative to acquire wireless tower leases whose renewals end within the next 10 years. This program is specifically designed for cell towers (vs. rooftops) and prefers towers with more than one tenant. Our prices for these leases are NOT included in the above statistical report and have ranged from 200 x to 400 times the current monthly rent (or more). Pricing is calculated based on how far in the future the lease expires and the number of tenants on the tower. In addition to lump sum purchases, TCA is also offering a structure that would pay additional rent UNTIL the lease expires and then share in a partnership arrangement with the seller based on how the lease is renegotiated at expiration. We cannot stress strongly enough that a landlord to a tower company or carrier should NOT extend a lease that is about to expire without discussing it with us. The initiatives of the tower companies to extend leases on towers with multiple tenants on them are the most important to them – and there are buyers in the market that will absolutely pay MORE, not less, when a lease is about to expire. You should understand that value before signing any extension amendment! If you have a cell tower lease on your property that has all of the optional renewals ending in the next 10 years, and whose lease does NOT contain a Right of First Refusal, contact us today. Tower Company entrance into the rooftop lease acquisition space – 2018 demonstrated a continued interest in acquisitions of rooftop leases by at least one of the public tower companies and we expect that trend to continue into 2019. Purchase offers by these strategic operators have been structured as ‘Master/Sub’ lease arrangements where rights to the entire rooftop and existing leases are purchased using a master lease structure and granting rights to the buyer to sub-lease to additional tenants on the property. While the offer prices tended to be slightly higher than non-strategic buyers prices for rooftop rents, the offered structure have proven to be complex and result in difficult documentation and closing processes. Offers to share in the rent from additional tenants are usually part of the offered structure with 60/40 being the objective participation between Buyer and Seller. While many sellers ARE interested in having additional revenue put on their property that they can benefit from, TCA cautions sellers that any sale structured with the promise of additional rent down the road needs to be carefully reviewed. Financial buyers have no ability to bring tenants and the larger tower companies, with tens of thousands of sites across the U.S., almost always have their own towers nearby that would be much more profitable for them to place another tenant on vs. your rooftop. If you are seeking additional revenue, consider selling to a more nimble strategic buyer with fewer locations near your property. TCA recommends that property owners approached to sell the rights to their rooftop to any firm obtain professional advice. We would be pleased to review these offers for you, at no cost. T-Mobile Consent Requirements – If a property owner ever wants to monetize their lease either for additional working capital or to de-risk the possibility of losing the revenue in any de-commissioning, etc. due to mergers among the carriers, we strongly recommend you find a way to eliminate any ‘consent to assign’ or ‘consent to sell’ from a T-Mobile lease. Removing it is NOT possible once the lease is established (why would they?) but if you are negotiating a new T-Mobile lease, it would very much benefit you to strike any such language. While T-Mobile has no history of purchasing their own leases back, our understanding is that they will only consent to a sale if the buyer gives them a sizable reduction in their rent and agrees to make it difficult to impossible for them to re-sell or re-finance the lease as part of their own portfolios. This results in much lower prices or, worse yet, a complete inability of the better capitalized buyers to make an offer on your lease at all. AT&T Right of First Refusal buy-back initiative – In 2017 AT&T quietly announce the availability of a significant pool of capital to proactively purchase their own rooftop and ground leases from their landlords who are interested in lease monetization. This program was put in place to prevent both the landlords and AT&T from being taken advantage of by unscrupulous buyers and has continued to this day. TCA is a national partner of AT&T and we can explain the pros and cons of monetizing a lease and provide a quote directly from AT&T if a seller is interested in selling their lease to AT&T. 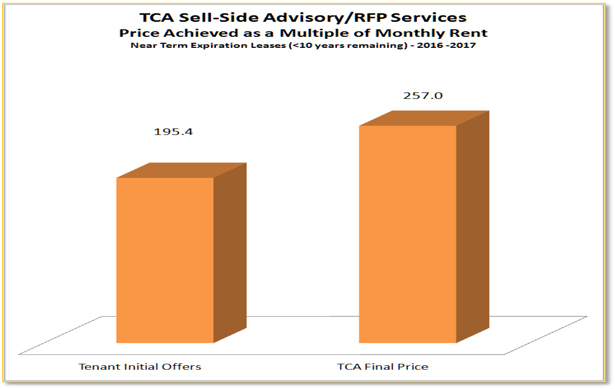 TCA offers remain ahead of initial offers from other aggregation firms and have an average approaching 180 x the monthly rent (15 x annual) over the last 6 months (normalized for 3% escalators and 99 year purchase terms). Prices for 3 of the major tenants (AT&T, Verizon, T-Mobile) had remained somewhat undifferentiated but sellers should anticipate volatility in pricing Sprint leases as they continue to take 4th place in a crowded market. The market for most other tenant-credits (e.g. Clearwire or Cricket for example) continues to remain void of purchasers. A notable exception is pricing for US Cellular leases which TCA will begin tracking as our data on these assets reaches significance. 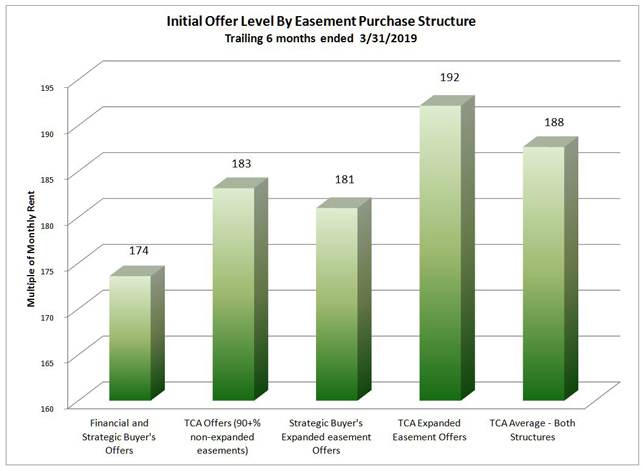 Tower Capital Advisors offers have remained ahead of most all buyers for our specific easement purchase structure and expanded easement purchase structures. Our financial aggregator competitors continue to attempt to come in low and slowly rise to meet competitive pressure and our strategic competitors continue to offer structures that are involved, over-bearing and difficult to document and close. Sellers should be very wary of offers to purchase general or expanded easements on their property that attempt to capture new tenant revenue and promise to ‘market’ the site to the carriers. Carriers put sites where they need them, not where they want them, and few of the buyers in the space have any actual initiatives or personnel dedicated to marketing at all. Their goal is to capture a piece of unforeseen rent, without having done anything to deserve it. Finally, note that no one can ‘bring new tenants’ to a tower they don’t own and few can bring on to a rooftop. Ask for statistics and references from any buyer offering to bring new tenants to you and, when you do not get any, you are likely to agree. TCA’s best-foot-forward offers still surpass the initial offers of all of the aggregation firms. TCA does not ‘start low’ and work our way up to match competitive bids. We do not believe that property owners looking to sell their leases should want to deal with buyers that initially try and take advantage of them and, in the face of competition, increase their offers after the fact. TCA has been able to keep ahead of the market with our offer prices after having entered into a facility arrangement with our institutional funding partner. TCA is not a ‘broker’ and we close directly onto the balance sheet of our funding partner. We would be pleased to arrange a call explaining the process of selling a lease with our closing and legal department at your convenience. TCA’s objective in providing you and the public with this data is that we hope you will allow us to bid on your site when you choose to sell. 3/31/19 Update: Average Cap Rates offered by TCA for Wireless Leases. Tower Capital Advisors currently performs a regular service as part of our scope of work as a national partner of one of the 4 major carriers that requires us to analyze, structure, evaluate and price numerous tower and rooftop leases being acquired for our own account or for AT&T directly. Our own acquisitions are consummated with one of two well capitalized funds or on behalf of our carrier partner. If you own one or more cell towers with cellular tenants, we believe our expertise in maximizing the value of these assets would benefit any current or future seller of wireless infrastructure. 1. As noted above, with the acquisition of Verizon, AT&T and T-Mobile’s towers by the public tower companies, a significant push is on to get the landlords (property owners) under these sites to sign extensions and amendments. One of the main purposes of this effort is to include Rights of First Refusal and other clauses in the amendment that can and will reduce the value of your lease if monetization is an objective. See the Recommendations for Sellers in the Lease Buyout section of TCA’s website. 2. Few, if any, players that aggregate with the intent of flipping a pool of assets for sale to a tower company or into a security and making a spread have survived into 2018. As predicted, they were not able to keep up with competitive prices and sustain large organizations with high overhead. Working with TCA allows you to take the profit that otherwise would have been made by these firms for yourself. 3. Also as we predicted, the total number of industry buyers continued to contract with the loss of another financial aggregation firm and the move by other firms to ‘pure service’ providers. Those ‘services’ are likely to include working with the carriers or tower companies to contact landlords and effect rent reductions while obtaining Rights of First Refusal and Expanded Use clauses in any amendments. It might also include buying assets with the promise of sharing in ‘above scheduled rent’ only to sell the asset or assign the extensions to the tenant. TCA does not recommend Sellers sell to their tenants if they ever anticipate future upside from increased rent, and now you can include in that recommendation not selling to someone who, in turn, sells your lease back to your tenant. 4. The reduction in total true portfolio purchasers has resulted in a number of brokers/intermediaries entering the market. We do not feel that Sellers should retain brokers that they have to pay in this sector and can, either through direct contact with purchasers or by working through Buyer paid intermediaries, obtain better pricing without doing so. Additionally, TCA does not usually recommend the use of law firms or attorney’s that specialize in the wireless sector as any good real estate attorney can handle the type of documentation associated with these transactions on a more cost-effective basis. It is also unusual for a law firm to be compensated on a percent of purchase price basis. A Seller should want his attorney to be un-biased with respect to whether a transaction closes or not. 5. Continued move by the Fed to increase interest rates is expected and will, likely, result in future declines in offer prices. 6. Reiteration: Marketing caveat venditor (Seller Beware): Site Owners that sell for less than they should are sometimes sold on the promise of the buyer bringing additional tenants to their property. Many if not all of the financial aggregation firms offer ‘sharing’ arrangements for future revenue they claim they can bring to your site. In the case of cell towers (vs. rooftops), only the TOWER OWNER has anything to do with soliciting new tenants – so a pure-play financial buyer of your ground lease cannot do anything to bring more revenue to the property. In the case of both cell tower or rooftop installations, only the strategic firms and the carriers themselves determine where sites are needed and most if not all of the financial aggregators do nothing about marketing your property. Large cell tower companies offering to buy your rooftop may be conflicted with respect as to whether to put the next carrier on your property or on their tower, which would be more profitable. Bottom line: Don’t be fooled by groups that pitch you on how they will bring you more revenue down the road. Few firms actually even try and if it happens at all, it will be purely up to the carriers that need coverage in your area, not the buyer of your lease. Interest rates increases and inflation are coming and when they do, the price for wireless leases WILL eventually decline. Take advantage of the currently high prices in 2019 if you are interested in selling. If you, as a prospective Seller, are interested in monetizing your lease, we believe now is the time to do it. Get an offer from Tower Capital Advisors today and see how it compares to what you have been offered in the past. Disclaimer: Information is provided by TCA based on public available resources, personal experience in the industry acquiring, holding and selling millions of dollars of these assets since 2001 as well as from frequent conversations with industry players. It is opinion, albeit experienced, and thus should not be solely relied on in deciding whether or not to sell your asset, how to sell your asset or to whom to sell your asset. Please call us at (800) 675-0144, or e-mail us at info@towercapadvisors.com for more information on either our direct buyout programs or advisory services. Registration is free. If you have a site, Register today and TCA will value your lease and the economics of any offers you have had. We may even have a better one for you. Aggregation firms have been contacting site owners for more than a decade to buy the rent they receive from cell phone / wireless carriers and tower companies on their property. These transactions are done either as easement and assignments or pure assignments of rents. The rents are purchased by these aggregator either in perpetuity (preferred) or for fixed periods of time ranging, typically from 20 to 50+ years. After the expiration of the rent assignment (for other than perpetual terms), the rents typically revert back to the property owner. The prices in the industry are typically discussed from the aggregation firm’s perspective either in terms of multiples of the monthly rent amount being purchased (or for annually paid leases, monthly equivalent rent) or in terms of the yield they would obtain on the transaction if held for the term of the rent assignment. Aggregation firms, by our definition, are privately financed companies that acquire the leases temporarily with an outlook towards a pool sale or a securitization finance exit. Excluded from our definition of ‘aggregators’ are firms whose main business is operating towers (e.g. public tower companies) or firms that hold the assets in more permanent investment funds. While these firms are also incentivized to acquire the assets as inexpensively as possible absent making the purchases in a competitive environment, we do not consider them ‘flippers’ that act only as temporary homes for the assets. Over the last dozen years, structures for the purchase and prices for wireless lease assets have varied widely with significant upward pressure in recent months (but now declining). As the asset class has become more and more in favor on Wall Street, the prices to the site owner have increased due to competition among the aggregation firms. The price for pools of the assets has also risen. Despite this, there is a large disparity between what site owners are offered for their leases and what institutional investors and pool buyers are willing to pay. This difference represents the profit opportunity for an aggregation firm. Note that 2013 data from the above chart was derived from Q1 only. Q2 and Q3 saw dramatic increases in these average offer prices with Q4 showing a drop back to reality. Note also that Seller’s working with TCA have continued to experience the highest offers in the industry. Today, the most preferred structures (thus offering the best prices) are transactions that acquire the assets by taking a perpetual easement on the property whose footprint mirrors (or optimally expands) the footprint the carrier tenant has on the property as well as taking an assignment of the rent (in perpetuity). Aggregation firms will typically offer the property owner a sharing of any rent that comes in through expansion by existing tenants or addition of new tenants into their expanded easement area. In 2012, across the spectrum of tenants and domestic markets, a typical lease (2) with one of the premier tenants (AT&T, Verizon) might have been purchased from a property owner by an aggregation firm for, on average, 120 X the monthly (or equivalent rent) for a 40+ year easement purchase. 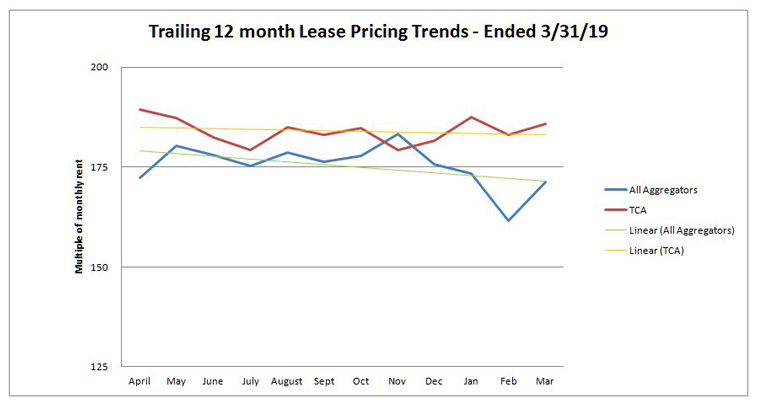 More recently, averages for these same leases have approached 140X or more. To simplify, that means if his/her current rent were $1000/month and if his/her negotiating skills were intermediate or better, a site owner selling his/her wireless rent for 40 or more years would have been offered $120,000 growing more recently to $150,000 for their lease or more. Pools of these leases sold on a “whole-loan” basis to tower companies or infrastructure funds or securitized, are commonly known to execute at 15-16+ X annual rent. That equates to 180 X the monthly rent. 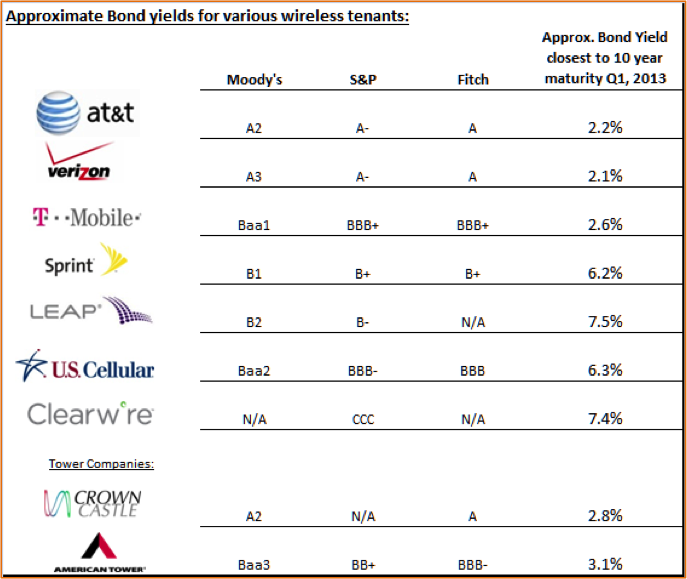 Secondary trading in the securitized assets purportedly suggests these valuations to be even higher and TCA believes that securitization issuances of these ‘ground and rooftop wireless lease assets will be driven even higher (perhaps to 18X or more). (2) A typical lease would have an original 5 year term with mandatory renewals every 5 years for 3 or 4 more terms of 5 years, be somewhere mid-stream in the overall term of the original lease and renewals thereof, would have 3% per year annual escalation rate and would be with an investment grade tenant credit counterparty. TCA believes that a direct sale to a ‘hold’ investor such as our buyout pricing is based on can result in higher prices for property owners.